Poughkeepsie Day School is a progressive co-educational school serving students students prek-12th grade. It has close to 300 students in three divisions. It was founded in 1934 and today’s school inherits a powerful legacy of change and innovation. Much has changed in those eighty years but throughout PDS has maintained a steadfast belief in children as learners, teachers as guides and learning as something that has both joy and purpose. From its inception a PDS education has been founded on relationships and learning by doing. It values play as creative cognitive growth and working together as a means of effective progress and the promotion of democratic values. Learning at PDS is active, social interactive and experiential. In a fast-paced, digitally-driven, globally-connected world PDS fosters the creative independent problem-solving talents of children. PDS respects each child as a traveller on a distinctive journey. It graduates students with an undiminished thirst for learning, the capacity to care, and with the intellectual, practical and social skills to live productive lives and make a creative contribution. 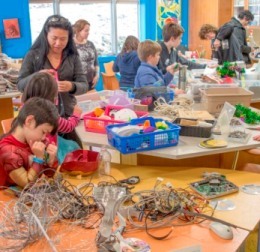 Poughkeepsie Day School hosted the inaugural Poughkeepsie Mini MakerFaire in November 2014 with over 800 attendees This will be an annual event bringing makers of all kinds to the school and showcasing some of our own creative community as well as makers from across the region. Middle School Davinci- the common room of the MS, leading back to the DaVinci studio. Poughkeepsie Day School has three dedicated maker spaces. Space one, the iStudio, is used for video making classes, 3D design and electronics and circuit building. It includes 3 3D printers, easily movable desks on wheels, a 24’ long “blueboard”, (chalkboard as a floor to ceiling writeable wall), and Mac workstations, also on movable desks. This space also includes a “Smithsonian Collection” of technology dating back approximately 100 years on a portable set of shelves/viewing station. Space two, the DaVinci studio, is a multi-purpose room for science, art and Maker purposes in the Middle School. It is also outfitted with movable desks, woodworking and digital tools and a collection of zoological samples. Space three, the iFactory, is equipped with tools and materials for tinkering, making, robotics and engineering It is used for “messier” work such as woodworking and other kinds of fabrication. Poughkeepsie Day School embraces the ethos and spirit of making throughout the program. Our tradition of active and experiential education mean that learning by doing and by making are at the heart of our thinking and practice. Designated courses focus on arts/tech, tinkering, engineering and design and make very specific use of our Maker spaces. Beyond that, our emphasis on interdisciplinary approaches, creative thinking, access to technology and practical expression ensure that the Maker spaces are used for a wide variety of classroom projects across all divisions and traditional subject disciplines. iFactory- students choosing from an assemblage of raw parts to make a project. As part of their integrated social studies “Market Street” first graders visited the local stores, business and organizations along a main thoroughfare in the city. Back in the classroom they made cardboard models of the buildings. Later their images were 3D scanned into the model. The fourth and fifth grade class wrote fiction stories. Some children elected to create 3D models of their character. When they read their story out loud to their classmates, they showed the model of the character. Middle School – The schedule for the middle school allows for Discretionary Time. Each trimester one grade comes into the iStudio to work on a project. The sixth grade completed an electronics and programming series in which they built and programmed a blinking LED signal – a simulated traffic light with tri-color LEDs and color mixing. Finally, they constructed a simple robotic arm controlled by a knob and movement sensor. In middle school mathematics students wrote programs and printed their own 3-D manipulatives for geometry. The eighth grade coded a programmable night light and printed out the 3-D model. They used micro-sized programmable computers, strips of tri-colored LEDS and a buttons. Using these parts, they each build a night light with eight color sequences. A high school course works towards competing in the FIRST Tech Challenge in the iStudio Maker space. In the high school arts tech elective – FabLab – students design and build interactive art pieces. Design thinking and making are a good match for the progressive approach to learning that is the tradition at Poughkeepsie Day School. Our definition of maker is broad. It stretches across all aspects of a program that calls for learners to be at the active, creative center of their own learning. New methodologies and evolving and powerful tools lend new energy and capacities allowing the school to live its legacy of “learning by doing” in new and effective ways. This emphasis enables maker-centered learning that empowers every learner to be a maker. We continue to formalize and expand Maker and Design Thinking initiatives across the curriculum and develop project based learning to incorporate all aspects of STEAM (Science, Technology, Engineering, Art and Mathematics). This interdisciplinary and arts infused approach to learning is a traditional element of the PDS design for learning and professional development. Last year the school hosted a well-attended conference for educators – STEM to STEAM and Beyond – with nationally recognised keynote speakers and many interactive workshops led by leaders in the field including high school students. PDS held the first Maker Faire in the Hudson Valley in the fall of 2014. It drew Makers, exhibitors and hundreds of attendees from across the region. This will an annual event and we are now planning for an expanded Faire for November 2015. The MakerFaire is an opportunity for the school to showcase its many makers – poets, artistic upcyclers, cupcake bakers, farmers, felters, home canners, weavers, carpenters, environmentalists, mechanics, and techno folks – and to be a hub for creative people who are happy to share their world of making. Poughkeepsie Day School will continue to expand the making and design thinking components of the program and seek to expand interdisciplinary connections as part of a “make it happen” and “make learning visible” approach to learning. Specific ideas include additional opportunities for Lower School students to build on their creative construction work using physical and digital tools with both coding and woodshop. Middle School arts option will continue to grow with additional creative opportunities to tinker and create with circuits. The idea is to integrate design, making and construction across the curriculum projects in math, humanities and music. Bridge building with popsicle sticks is a traditional component of the high school calculus class. Switching to a digital construction that is then coded and printed is the next step. There are additional plans afoot for using our tools and capacities to engage in authentic problem solving and the invention of assistive tools for specific disabled clients. Our maker tools and facilities allow us to dream of next steps for making across the curriculum and beyond.